Times New Viking is a lo-fi indie rock band from Columbus, Ohio. The lineup consists of guitarist Jared Phillips, drummer Adam Elliott, and Beth Murphy on keyboards. Murphy and Elliott share vocal duties. 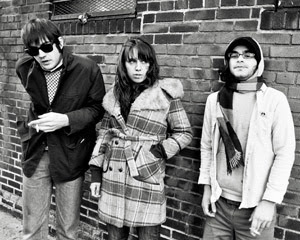 Their name, "Times New Viking," is a play on the popular typeface Times New Roman[ They have released four albums: 2005's Dig Yourself, 2007's Present the Paisley Reich, and 2008's Rip It Off, which NME gave an 8/10, and 2009's Born Again Revisited. Rip it Off reached #17 on the Billboard Heatseekers chart. The band was formerly signed to Siltbreeze and Matador Records. In January 2011, they announced that their fifth album, Dancer Equired!, will be released in April via Merge in the US, Wichita in Europe, Pop Frenzy in Australia and Big Nothing in Japan.